Griffith Spurge (Euphorbia griffithii): growing, planting, caring. A vigorous shrub with yellow-orange-red flowers. 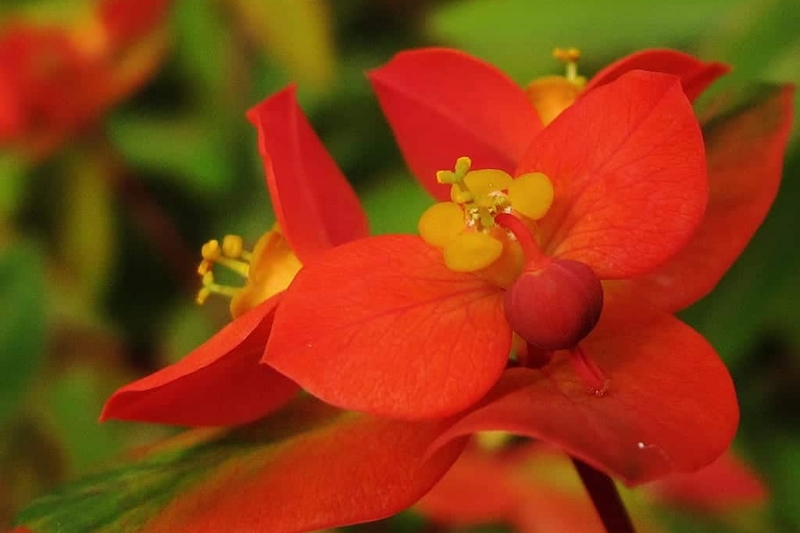 Euphorbia griffithii - the Griffith's spurge - is a species of native to Bhutan, Tibet and south west China. It is a spreading herbaceous perennial growing to 90 cm (35 in) tall, with erect reddish stems and narrow dark green leaves with red central veins, turning red and yellow in autumn. In summer it produces bright red and yellow flowers. Numerous cultivars have been selected for garden use, but it is a vigorous plant, and can be invasive. During growth, water once or twice a week. Water adult plants by big inputs even if you do it less often; the plant will develop a better root system if it has to fetch its water in depth. When watering, wait until the water that you pour stop rushing into the ground, and forms a small puddle. Unless otherwise specified, do not wet the foliage: plants "drink" by their roots. The regular pruning of euphorbia is not essential. However, we can cut down the stems in spring or fall, to limit the development of the plant. Trim right after the end of flowering to prevent seeds from sowing spontaneously. Simply cut the flower stalks about 5 cm off the ground.